While away at a retreat this week I had a conversation with a friend who will be giving his oldest daughter away in marriage this weekend. While we are several years away from that as our daughter is in her mid-teens, I was curious to know what it’ll be like. I wanted to know what he thought and how he felt. I can only imagine what it will feel like to see my baby girl walk down the aisle and enter into a lifelong commitment of marriage. As I asked him questions I was pleasantly surprised at how calm he was about it all. As I said—oldest daughter, first daughter to get married, and less than a week away! But he was calm, cool, and collected. As our conversation continued, I began to process it all. It must have been evident as he looked at me and said, “You’re gonna write a blog post about this, aren’t you?” We both laughed. Of course! If I’m wondering how I can be as composed as him and not seem nervous on my daughter’s wedding day, then there is another dad out there wondering the same thing. We all can benefit, so I want to share so you can be in a position to best handle your daughter getting married someday as well. I noticed three things through our conversations. These three insights will help a dad to calmly and confidently enjoy giving his daughter away in marriage. My friend and his wife have been a great role model for their kids. They’ve set a solid foundation for their marriage and for their family. From conversations with them I know they’ve had challenges to overcome in marriage, but they’ve learned and grown from these things which has helped them to have a better marriage. Their kids have witnessed this firsthand like no one else. So, their daughter knows what a lasting and fulfilling marriage looks like. It’s the same way banks teach tellers to recognize counterfeit money. They show them what good money looks like so they will know a fake when they see it. This young couple has a model and tools to succeed based on watching their parents’ marriage. I’m certain one of the biggest challenges dads have with their daughter’s boyfriends, fiancees, or husbands is trust. Can I trust that you will love, care for, and treat my daughter as well as or even better than her mother and I have? That’s a huge question. My friend’s responses indicated he had no concerns at all in this area. One of the reasons is because he knows where his future son-in-law’s trust resides. Therefore, dad can trust his new son-in-law. His trust is in God. Not him and his strength, smarts, or skills. But the fact that he believes in and follows the most trustworthy person there is—Jesus Christ. When you are placing your daughter’s heart in the hands of someone who has placed their heart in the hands of Christ, you can trust this person and his relationship with your daughter. Everything I know about my friends, their marriage, and their family, shows that they’ve been raising and preparing their children for this day. Not just marriage, but life. They’ve instilled truth in them while raising them. They’ve taught them how to have thriving relationships. They have prepared their kids through love, discipline, communication, encouragement, and education to live in a way that doesn’t leave them wondering what will happen next when their kids are not in their sight. When you prepare your kids to be functional, valuable, responsible adults who live with integrity, they are prepared to make good choices. You can be calm, cool, and collected when they are making one of the most important commitments they’ll make in life. When you prepare your kids to live with integrity, they are prepared to make good choices. The entire conversation was refreshing and encouraging to me. As I enter new seasons with my kids it’s helpful to learn from others who are experiencing what we will one day. Hopefully, me sharing what I learned from our conversation will help you as well. 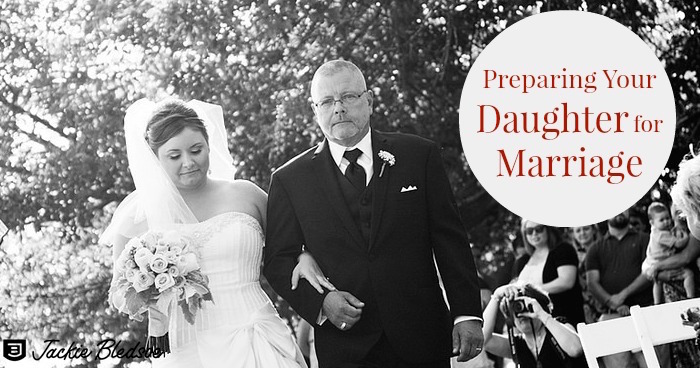 Question: What insights do you have to help other dads prepare their daughters for marriage? You can leave a comment by clicking here.